I found a recipe on Pinterest the other day for Krispy Kreme doughnuts. 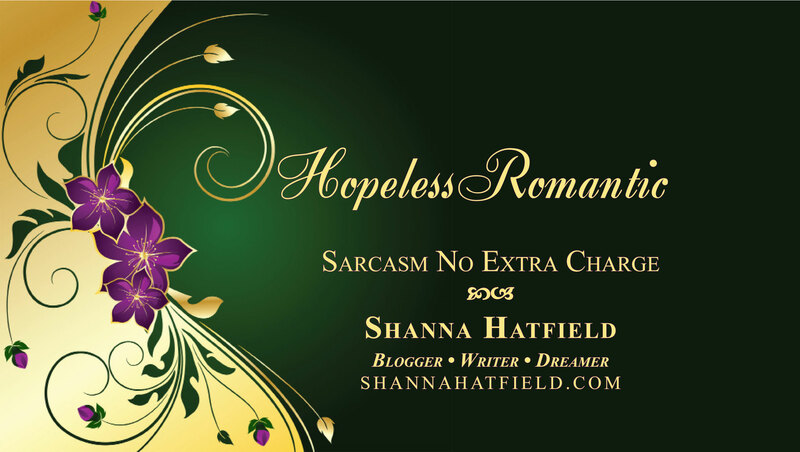 Since these are a particular favorite of Captain Cavedweller, I decided to give them a whirl. 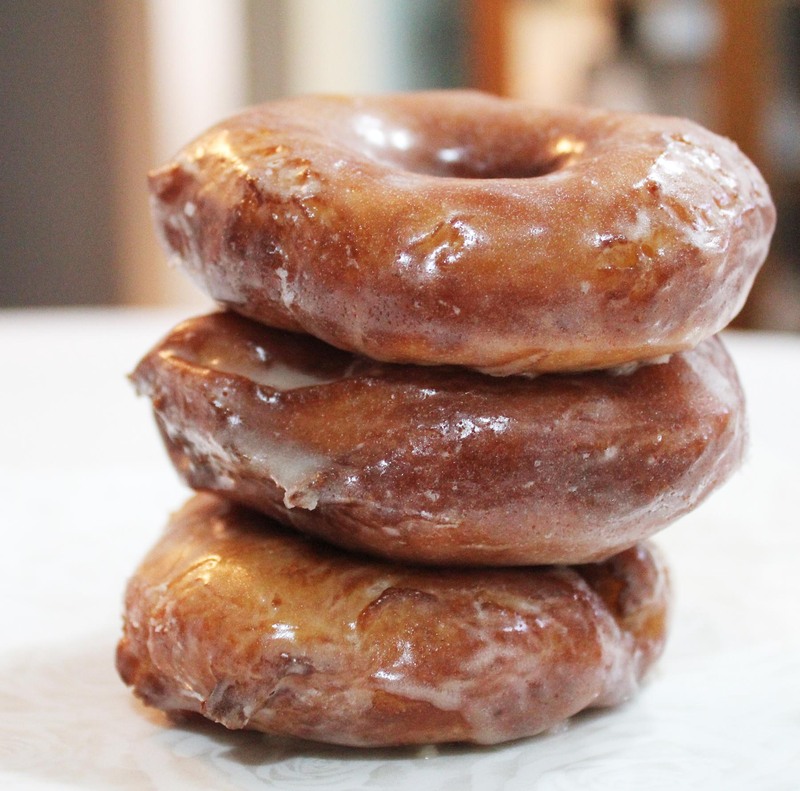 While they did not taste exactly like Krispy Kreme’s, they were the best homemade raised doughnuts I’ve ever had. CC agreed as he ate his sixth one. Scald milk then let cool. 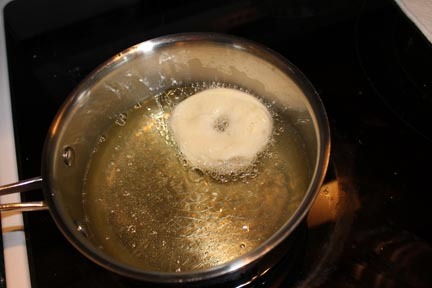 While it is cooling, add yeast packets to warm water in mixing bowl. Mix ingredients together on low speed until blended, then high for two minutes. 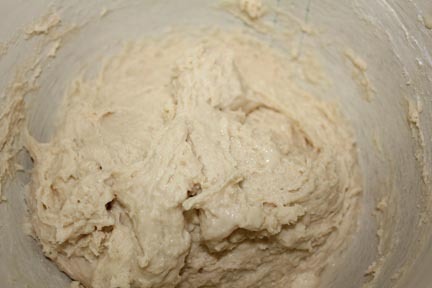 Once dough is mixed, cover and let rise until double, about an hour. 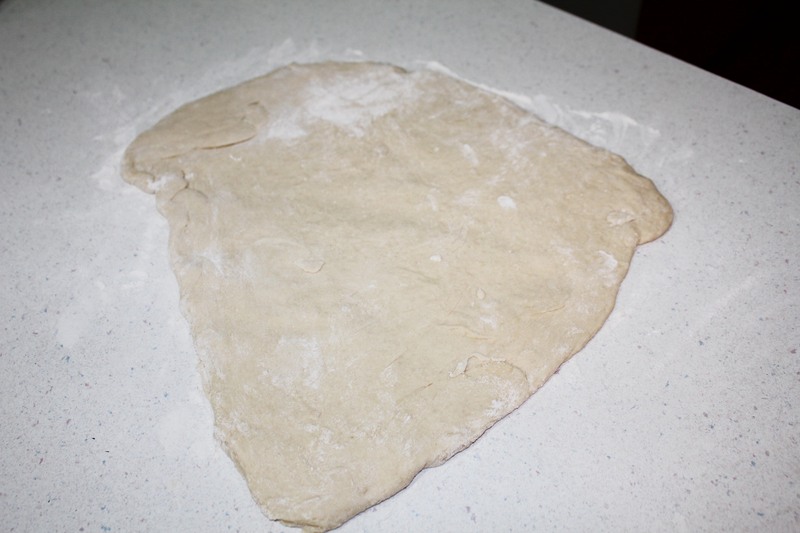 Turn dough out on floured surface. Handle as little as possible. 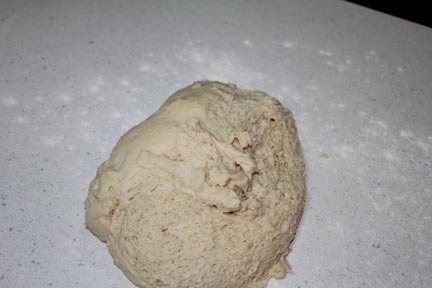 Roll dough out about 1/2 inch thick. Again, try to handle as little as possible. I could tell the doughnuts I made from the dough that I rolled out a second time from the excess after I cut the first group. They were a little tougher. Less handling = softer doughnuts. 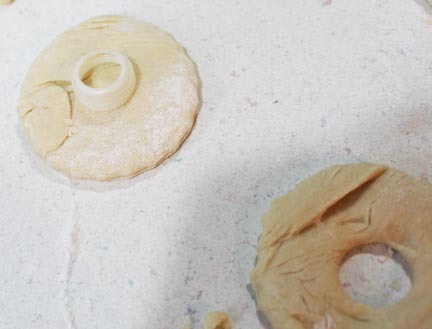 If you have a doughnut cutter, go to town cutting them out. 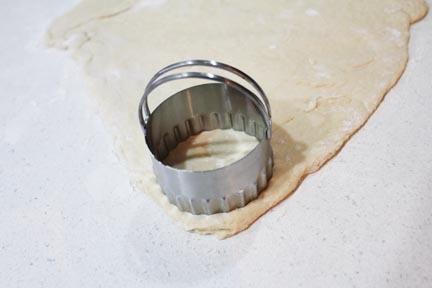 If you don’t a glass or biscuit cutter will work. 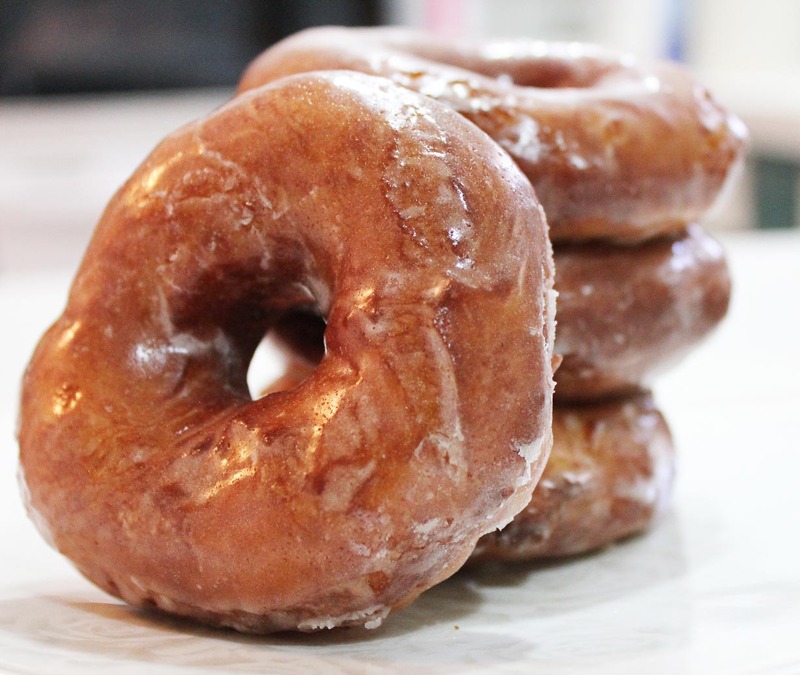 If you don’t have a doughnut cutter, you’ll have to get creative in cutting out the holes in the center. A Wilton cake decorating coupler worked perfect. Cover doughnuts and let raise until double (about 45 minutes). When doughnuts have raised, carefully slide into hot oil. Cook until golden brown (about 30 seconds or so on each side). 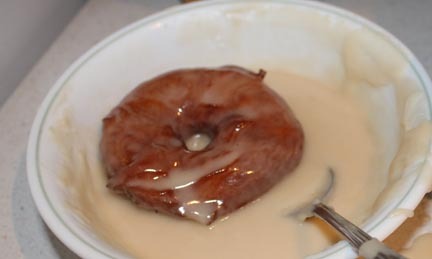 Dip doughnuts into glaze after draining. Let rest on rack until glaze is set and they are cool enough to eat (but still warm!). Enjoy! And try not to eat as many as we did! Scald milk and then cool. 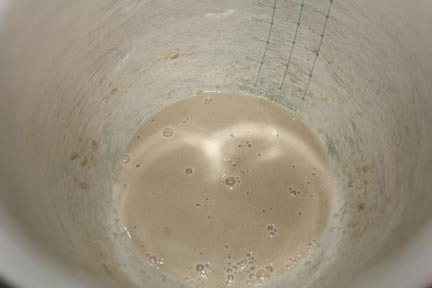 Dissolve yeast in warm water in a large mixing bowl. 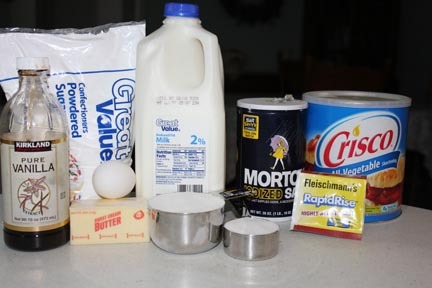 Add in milk, sugar, salt, eggs, shortening and two cups of the flour. Mix on low speed until blended, scraping the bowl frequently. Once all the ingredients are combined, mix on high speed for two minutes. 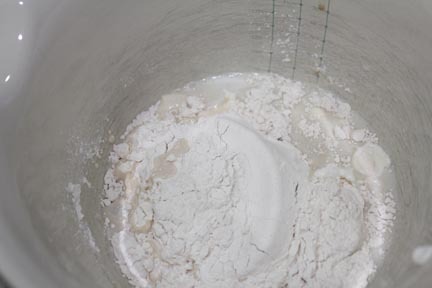 Stir in remaining flour until well blended. Cover and let rise until double (about an hour). Cover and let rise until double (about 45 minutes). Heat oil in a deep fryer or heavy-duty pan until it reaches 350 degrees. 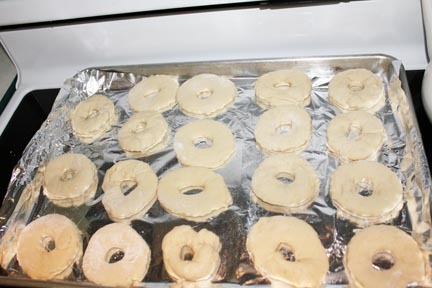 Slide doughnuts into hot oil very carefully. Cook until golden brown. I may have had my oil entirely too hot, but it was taken about 30 seconds per side. You can watch the inside of the doughnut hole and when it starts to turn brown, flip the doughnut over. Remove carefully from oil when brown and drain. 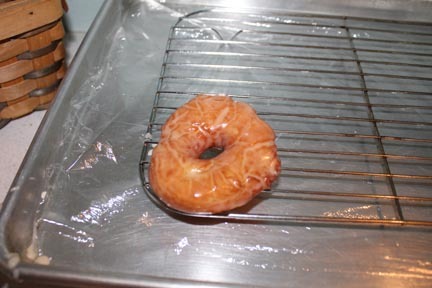 Dip warm doughnuts on the glaze then set on a rack to cool slightly before devouring way too many! To make the glaze, melt butter, stir in vanilla and powdered sugar then add enough hot water, one spoon at a time to reach desired consistency. It should be fairly thin. I placed the doughnuts right in the bowl of glaze, flipped them over to coat both sides then moved to the rack to finish cooling. I may never make these again since CC and I couldn’t leave them alone when they were fresh and hot. They weren’t that good the next day, so make sure you consume them all right away!